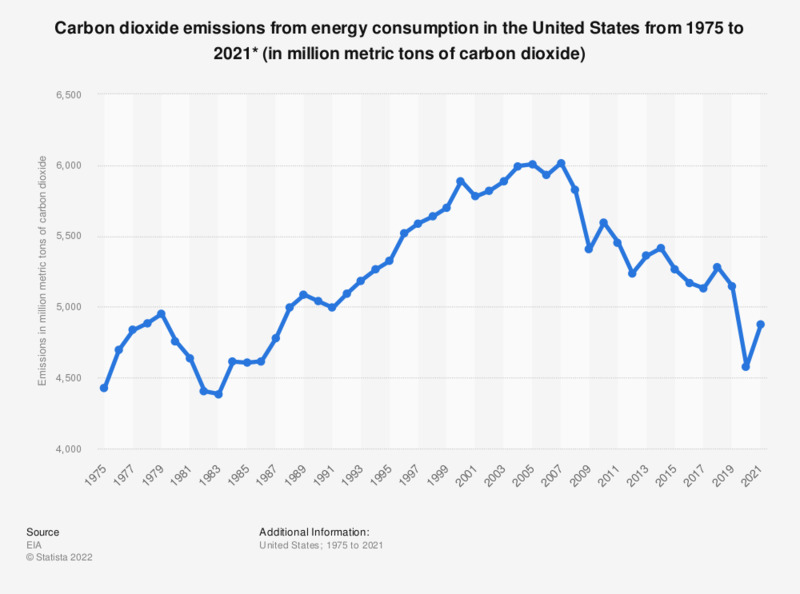 The statistic shows the total U.S. energy-related carbon dioxide emissions between 1975 and 2017. In 2017, around 5.14 billion metric tons of CO2 emissions were produced from energy consumption in the United States. In 2015, around 34.8 billion metric tons of carbon dioxide was emitted globally. The year 1997 marked the birth of the Kyoto Protocol. That year, global energy-related CO2 emissions stood at around 24.4 billion metric tons. Despite numerous assurances by policymakers to undertake efforts to reduce pollution, this figure increased to more than 36 billion metric tons of carbon dioxide in 2015. North America and the Asia Pacific regions are presently the biggest producers of carbon dioxide emissions as a result of a growing thirst for energy derived from fossil fuels such as oil, natural gas and coal. China is currently the most polluting country in the world , with a 28.2 percent share of global CO2 emissions in 2016. A comparative analysis between CO2 levels in 1993 and those in 2003 shows that emission levels in China have more than tripled in a span of ten years. According to a recent forecast, energy-related global CO2 emissions from the consumption of coal, natural gas and liquid fuels are set to rise to unprecedented levels through 2040, while U.S. CO2 emissions produced by the use of natural gas are set to grow from 1.2 billion metric tons of CO2 equivalent in 2010 to 1.84 billion metric tons in 2040. In 2014, in Lima, Peru, negotiations were held regarding a post-Kyoto legal framework forcing major polluters, including China, India, and the United States, to pay for CO2 emissions. Although most countries refused to ratify this latter treaty, there has been a worldwide commitment towards so called “green energy.” Global renewable energy consumption soared from 44.4 million metric tons of oil equivalent in 1998 to 420 million metric tons of oil equivalent in 2016. International investments in renewable energy sources increased six-fold, as the world has invested more than 241.6 billion U.S. dollars in alternative energy sources and technologies as of 2016. * According to the source, data include electric power sector use of geothermal energy and non-biomass waste. Excluding emissions from biomass energy consumption. Values have been rounded to provide a better understanding of the statistic. Everything On "Greenhouse gas emissions in the United States" in One Document: Edited and Divided into Handy Chapters. Including Detailed References.